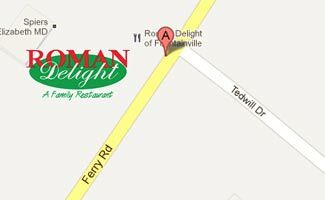 Roman Delight of Fountainville was founded in 1994 and has continued to be a family favorite restaurant ever since. Some of you may remember our days starting out “across the street”. In 2003, we moved to our new and current location in Fountainville Village. The move allowed us to accommodate more patrons as well as allow for a new bar area and beautiful outside patio area. Whether you’re a customer in the dining room, patio, bar, or even the take-out counter we strive to provide the best food, service and Italian favorites for you and your family! Our bright and spacious dining room and bar can seat up to 140 people. We will gladly take your party’s reservation for 8 or more. 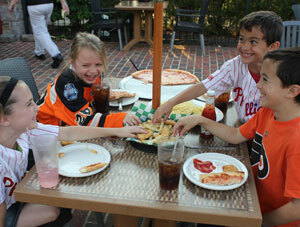 We love pizza parties, birthday parties, any type of party! Just give us a call for more information and reservations. The newly renovated bar features seven HDTV’s for all the big games and events so you won’t miss a thing…no matter which game is on! Be sure to check out our specials for exclusive daily bar specials and happy hour drinks and food. Our beautiful seasonal patio area is open whenever its not raining- perfect for enjoying the warmer days dining “al fresco”. Relax while enjoying the fresh air with a drink and our full menu.